After you select a folder from the WebFOCUS repository, you are presented with a list of the available Master Files, in the Data Source Selection dialog box, as shown in the following image. Scroll through the Data Source list, and click the Master File that you want to use. 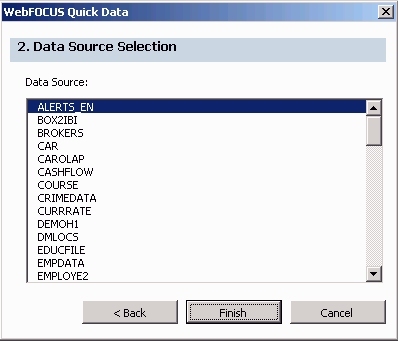 When you click Finish, WebFOCUS InfoAssist opens and loads the data fields associated with your selected Master File. You can select a Master File only when you are creating a new query with InfoAssist. The Data Source Selection dialog box is not available when editing an existing query or when using Structured Ad Hoc Forms. If you are using Repository Server authentication, the Master File dialog box is presented after a successful log on.